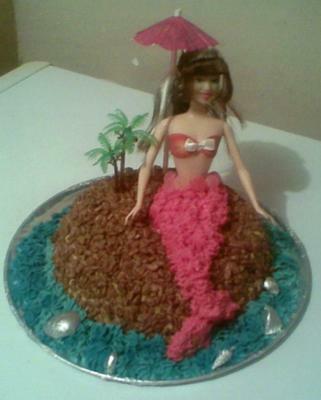 This Barbie The Little Mermaid cake was made of chocolate. The barbie legs were removed and I inserted a wooden skewer in the upper torso and fit in the middle of the cake. The whole cake was covered with butter icing at the bottom then covered in chocolate rice krispies to give the rock effect. The mermaid tail is made of pink butter icing and the sea of blue butter icing. The shells were in fact real shells, covered in foil.